Despite the looming threat of climage change , nature is continuing to do some pretty amazing things. Each year, the sand dunes in Lençois Maranhenses National Park collect water for the first six months of the year – between January and June. Come July, the valleys of the dunes turn into temporary pools filled with crystal-clear blue water, a phenomenon that only lasts until September. The seasonal attraction is a stunning sight – the deep blues against the whites of the dunes – and the temperature of the pools can get up to 30 degrees Celsius. 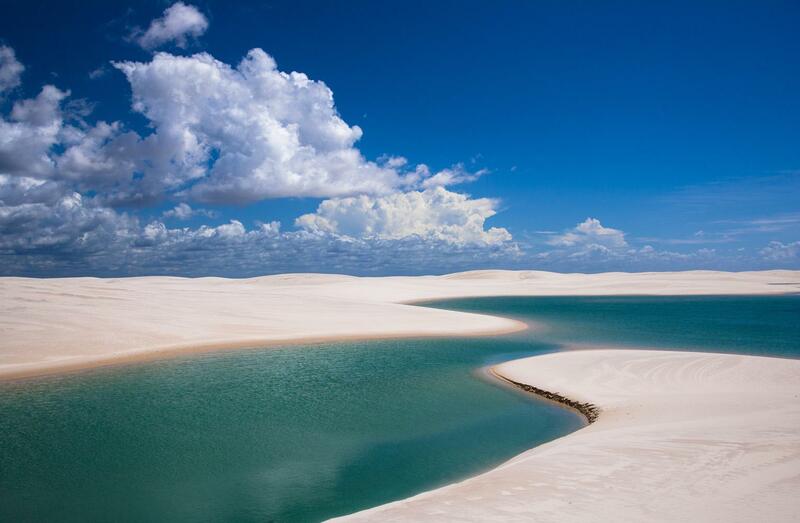 They are located in of Lençóis Maranhenses National Park, on Brazil’s north Atlantic coast. How do I get to the pools? From the UK, you would first need to fly to Brazil. The best airport to fly into would be Sao Luiz – where you can currently get flights for September for £688 return. From Sao Luiz, you can travel up to Barreirinhas by land or air which should be your base for seeing the National Park. From Barreirinhas there are many day trip operators who explore the dunes on jeeps and four-wheel motorbikes. It’s best to go with an official operator as the National Park covers over 600 square miles of land, making it easy to get lost. When is the best time to visit the pools? Between July and September is the only time of year the pools appear. Come October, the winds pick up and the pools disappear until the following year.